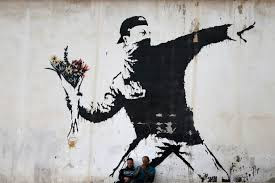 The renowned English artist Banksy is an icon in Palestine, known for his graffiti-style artwork completed on a trip to Bethlehem over a decade ago. 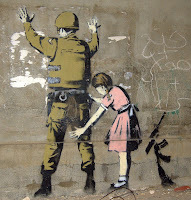 This tour will showcase surviving Banksy originals rendered on the Separation Wall that Israel built to restrict Palestinians from free movement around the West Bank and into Israel. The works included in the tour are the famous "Flower Thrower", "The Armoured Dove", "The Girl frisking a Soldier", "A Soldier checking a donkey's ID" and more. Some of the work by Banksy has been covered up or torn down, such as the "Mules tied by the tail", however enough still exists to inspire tourists and locals alike. In addition to viewing the artworks, you’ll have a chance to walk the Wall, visit the Nativity Church and manger Square, Aida Refugee Camp, and engage local people in conversation about the Occupation and the situation on the ground. You’ll also visit the Walled Off Hotel and the Banksy Shop where you’ll have the opportunity to purchase gifts commemorating your visit. The shop will provide spray paint so you can add your own graffiti to the Wall if you choose. Green Olive does not benefit from your purchases, but the Banksy Shop makes frequent donations to children’s activities in the Aida Camp. Please note that if you are going back to Tel Aviv there will be a few hours free time in Jerusalem in the afternoon before the shuttle returns, departing Jerusalem at 4.30pm.